No, not Ofsted, but the one that a member of the office brings to say “…you need to ring home”. How often has that happened to you? Over the last 8 years fairly frequently, be it about one of my parents or my eldest son, there is always a portent of it must be important to be reduced to asking the office to find me. next information from Kent regarding the health of my mother who has taken a turn for the worse. I am past the initial complete emotional outpouring which befell me when I interrupted a meeting to let the HT know. Phone calls between siblings at different points on their journeys to Kent. A pause ……. in time…… then what next …? I should be sleeping but … Ok looking back at week 2 in new post. In week 3 I have an ex pupil coming in to school at the end of. Monday to talk to our EAL students about how she mastered her English and has just graduated from. Imperial College. She (VK) arrived fromRussia in Yr 9 and I remember the joy on her face when I translated an assessment revision sheet into Cyrillic alphabet for her – I never knew how accurate the translation was but the thought made an impression. Wednesday I will have a department meeting that will start to follow up on the Performance management discussions last week and our lesson observations from the DHT, my line manager. The full KS3 starter units sow will be made available and filing of resources that will be logical for all will start. We have made a good start and I look forward to the meeting. The move from no GCSE groups last year to 5 is a shock from the marking side as they tend to write more but I am up to the task but time tabling where I have the lessons on consecutive days will need some thought. I think that at Staff briefing on Tuesday it’s my invite to share solo taxonomy with the whole staff – I like the success and welcome this has received already. Display work linked to it needs organising before open evening in 3 weeks. I have been asked about follow up IWB training by some staff so another service I can offer. Also TMHavering3 had its first batch of tickets go live on Monday at 09:00, by the evening all 25 tickets had gone. Next batch go live on the 29th and 25 more will be available. Most presenters approached have confirmed. There’s much more from the meteoric rise in knowledge of my socks having their own twitter account, to dropping into the Careers evening and having a good chat especially with the Army and RAF on direct use of geography in Geographic technician or air cartography sections. Finishing the week with a chat and few pints of a fizzy beverage for me (non alcoholic). My settling in and being relaxed has been commented on and I am glad that I have been able to do that. Week 3 bring it on, but don’t make Sunday too busy, some more rest is welcomed. 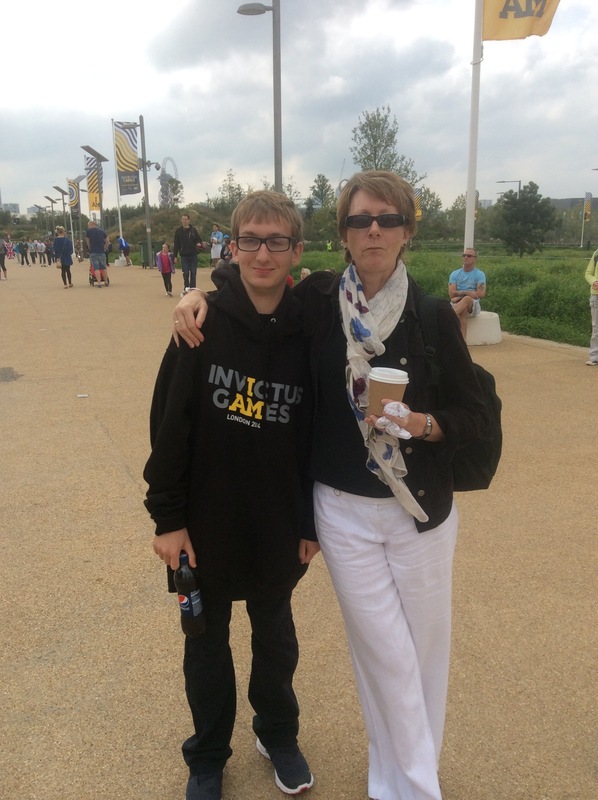 Last Saturday, 13th September 2014. three of us from our family went to the Queen Elizabeth Park – 2012 Olympic Park to watch some of the Invictus Games. 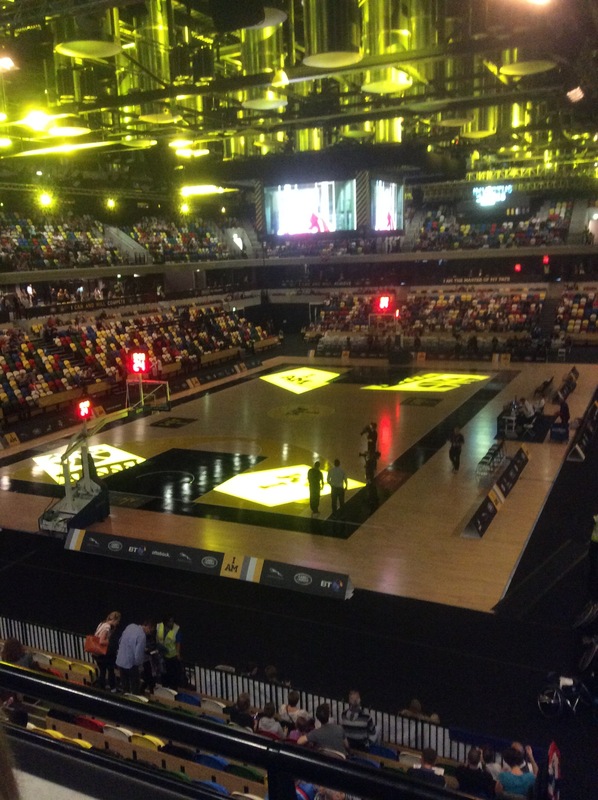 My wife had booked tickets for the afternoon session of the Wheelchair Basketball, an event we had seen in 2012 at the Paralympics. 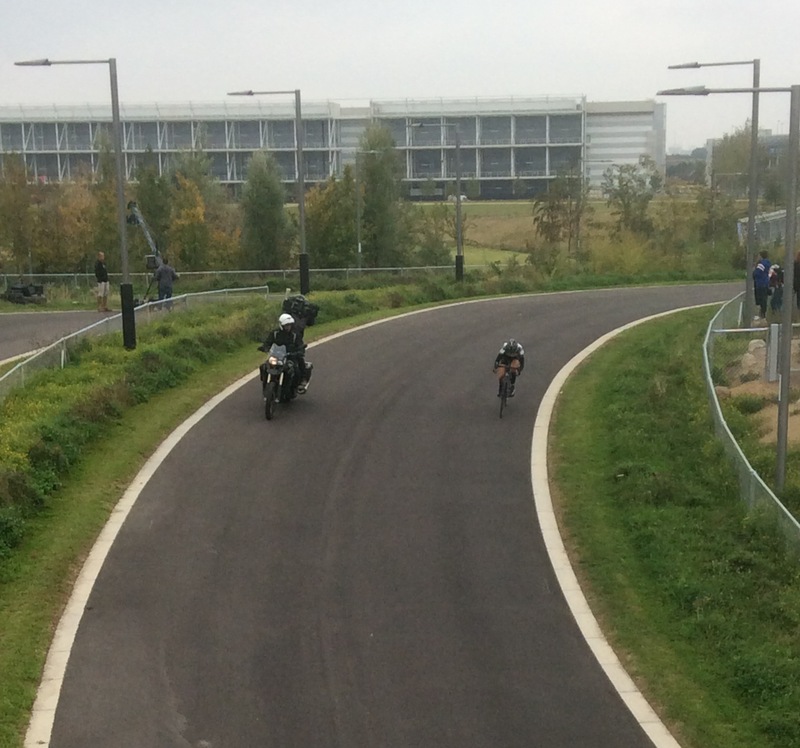 Like our 2012 visit we were going to see another event in the park – this time we did not need a park pass and we were able to enjoy the cycling on the Lee Valley road circuit alongside the velodrome which we will always know as “the Pringle”. We arrived at about 10am and walked through the park. At that time it was quiet and distances seemed further than they had in 2012 as there were fewer structures and people about. 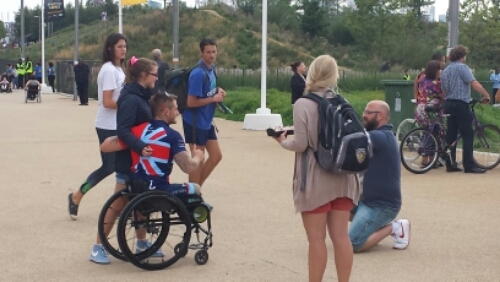 Even so it still appeared that the early events were gathering loyal supporters who outnumbered the amount of viewers at The Warrior Games as we had seen on a documentary recently. 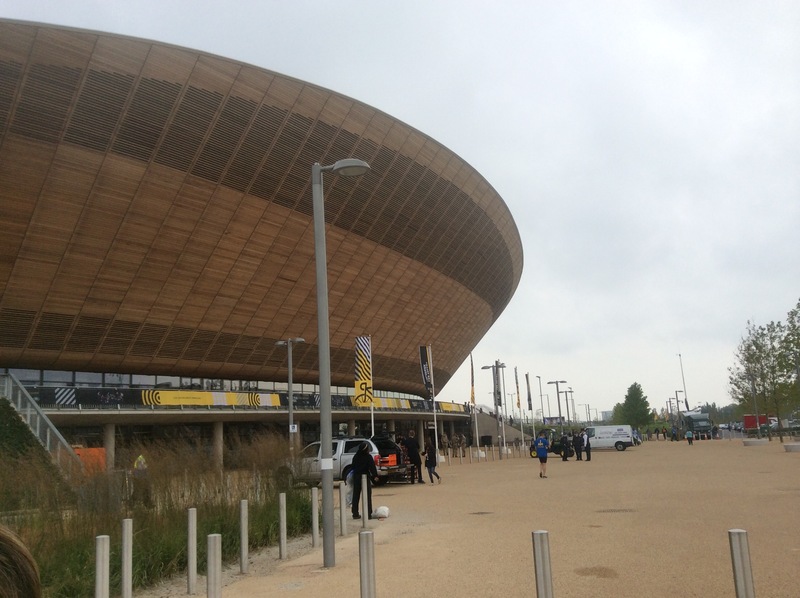 As we approached the velodrome we could hear the running commentary then espied the big screen showing the competitors. The morning’s time trials although pitting individuals against the clock were not as thrilling as the circuit races we saw later. That is until you noticed the t shirts worn by fellow spectators clearly there to support colleagues or family and friends. Banners were unfurled over barriers or the bridge near the finish. This was a smaller event, the link between the competitors and many of our fellow spectators early in the day was clear to see and it brought a tear to the eye and a lump in the throat. On a refreshment break we watched medal ceremonies on the big screen where medal lists went up with one, two, three limbs damaged or missing, yet they competed heartily. Victims of psychological trauma hid secrets we could not fathom. This was very emotional and we felt honoured to be there. 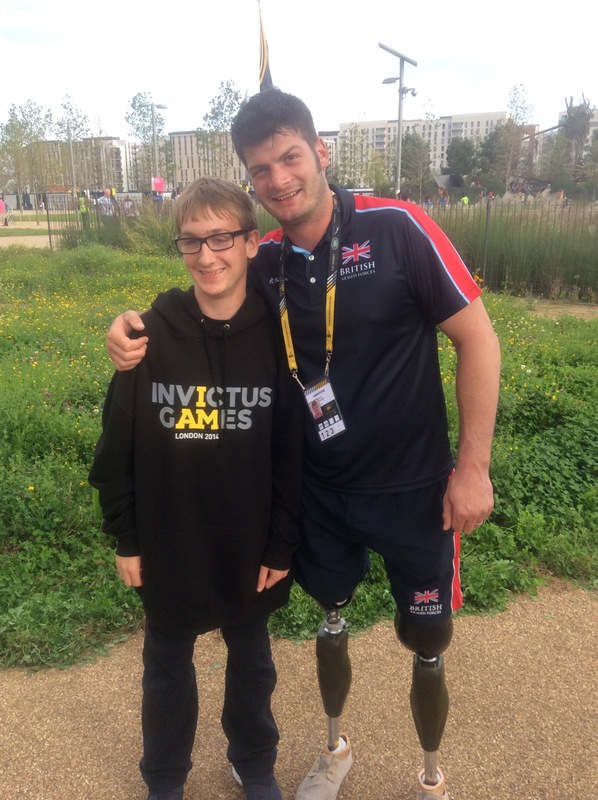 We saw one of the GB gold medallists whose family we had noticed earlier with his gold medal. My wife approached and asked if we could take a picture of him with our son, who by this point was sporting his Dad’s (mine) hoodie. Much too big but he wanted to be seen to be supporting the cause. The circuit races were a more competitive sight with the motorbike camera crew circling the track with the teams. 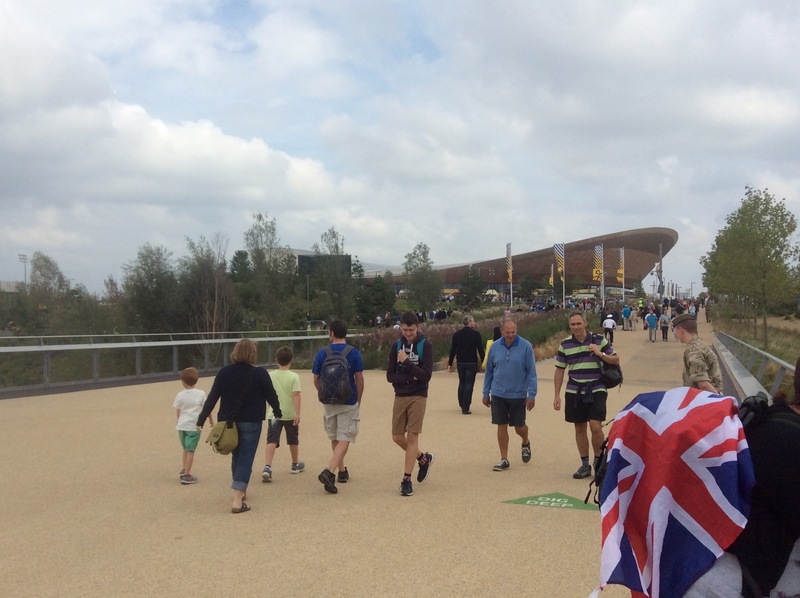 We watched as we moved off towards the Copperbox Arena for an afternoon of thrills and spills. I will post some of these images separately as they are on another device. The arena was busy with an expectant air. The commentator enthused the crowd and we cheered for all good play and either side. We were very fortunate to see 4 matches including both semi finals. 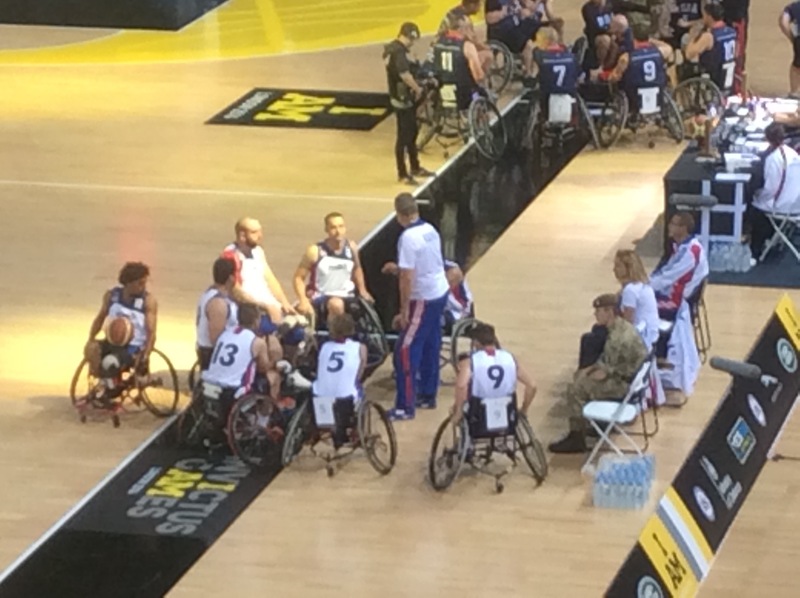 The two teams with full squads being GB and the USA. Later in the evening when we returned home we watched the Final on TV and were able to cheer on individuals by name having seen them play. After we left the arena we returned to the cycling area and watched more medal ceremonies identifying many individuals we had seen that morning. Two more GB athletes agreed to photos. We have to say thank you to the competitors for a spirited and inspirational day and a very proud son to have had his picture with 3 GB gold medal winners. Hi, a slower week night so I thought a blog post-et i.e. brief? Well Wed. and Thur. last week were staff training days and then I started to meet pupils on Friday. Tomorrow marks the end of my first full week in a new department, new role and my fifth school. I have returned to my love of Geography and am now Head of Geography at The Albany School, Havering. I have 4 staff working in the department. My first commitment to myself- until the new GCSE specs appear! stick and maybe tweak the current scheme of work. Do not rush in and reinvent the wheel as it were. Great idea and I am sticking on the GCSE plan currently. However, a muddled search for matching resources and sow at Key Stage 3 means that this week a new team have started to deliver and develop a new Key stage 3 course that will integrate the old and new National Curriculum specification for Geography. A non specialist, who has been grateful for being supported at last – why would you not support non specialists in your area? Two new staff, one from the Republic of Ireland and one from Australia and myself. David E. Rogers, Priory Geography and other departments that I have admired previously I have achieved that aim – I have a fresh team, open to idea, enthusiastic, a range of experiences and a school that supports us innovating – as long as we deliver on the dotted line – and fair enough. So initiatives, we are a Solo Taxonomy department and have been from day one, we are using it across KS3 and GCSE classes. We are looking to develop a curriculum that draws from the teaching and travel experience within the team. We will move away from a text based course to one where co-operative learning challenges attainment. Work by Ron Berger (An Ethic of Excellence) and Carol Dweck (Growth Mindset) will be used to challenge and extend. A new in school club: Explore – will combine looking at geography from an inquisitive, enquiry and Guerilla approach and also link curriculum support to assist or extend pupils who seek that. We have a duty in a school with a 13% EAL cohort to learn more about our school population’s cultures. To celebrate those cultural differences and entwine that into our geographical education. We will look outside to new ideas like the proposed Greater London National Park City. We will build on my extensive PLN to develop links with schools globally. Our first international visitor is provisionally booked for December from New Zealand. An aspiration includes a linked school visit to New Zealand for 2016. I want to lead an outstanding department within two years. I believe I have the foundations to do that and I hope to blog about our journey as a new phase and pathway in the Mishmashlearning process. Thanks for reading. As always your comments are welcomed.